We all know children need to learn early on the importance of good oral hygiene habits. 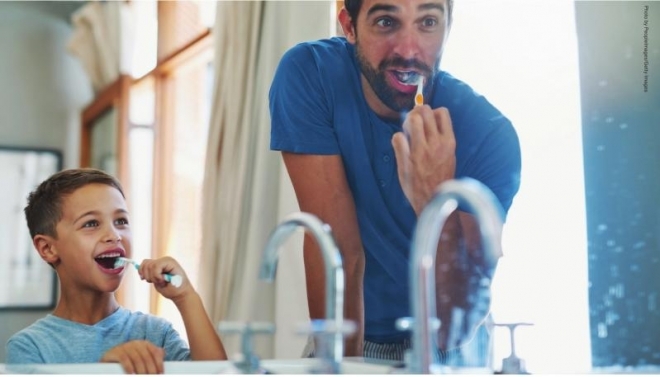 As a family dentist in Shreveport and father of two small children, I know first hand the challenge parents face trying to get the kids to brush. We are often rushed out the door in the morning because someone needs to put their jacket on all by themselves. And after a long day the last thing we want to do is fight with our precious children over brushing and flossing, am I right? I’m not here to lecture you or shame you if you’ve missed a few nights here and there. I get it; parenting is hard. My goal is to share some tips and tricks that have worked for my family and friends that will help you to get your kids excited about their dental health. The fact is, children are sometimes more susceptible to dental problems than we are. From bottles and pacifiers to celebrations and times where kids are often rewarded with treats, those sugar bugs can infiltrate more than you might think. We often hear from parents that oral hygiene isn’t that important since children will just lose their baby teeth and grow permanent ones anyway. That’s not always the case. Good oral health is necessary to ensure the health of the new teeth coming into their mouths as well. Teaching children to take care of their teeth and the rest of their body educates them to be responsible for their health. They will bring this attitude well into adulthood. • Take your children to the store to pick out their special toothbrush, toothpaste, mouthwash, floss, etc. This is fun for the whole family. Get them a two-minute timer, like the ones that come in board games. They are now empowered by having their own dental care kit, and you will be surprised how accountable they become to the timer. • Set up a reward system. When the children achieve a small goal – maybe weekly – they get a reward. The reward doesn’t have to cost you much; it can be extra time with Mom and Dad or something small, like stickers. • Bring them to the dentist regularly. The right family dentist will have the skills to create excitement and a positive experience. When do my children need to see the dentist? Apart from teaching your kids to brush and floss their teeth, it is also ideal to introduce them to dental visits. When you bring your children to the dentist, he/she will not just take a look in their mouths. We will give them a thorough examination of their teeth and gums and observe their jaw development all while making it fun and easy for your kids. We recommend the first visit when those first baby teeth erupt. Most parents will bring kids in around 1½ or 2 years old. The reason for this is to get them used to coming in. During these formative years, we want parents to be diligent about sticking with those visits to allow your children to remember the staff and feel comfortable coming to the office; it’s all about repetition to reduce your children’s potential fears. Now that we are on the same page with why we want your little ones to have regular dental care visits, let’s talk about what you can expect from a visit to the dentist with your kids. Dental cleanings are essential and should be scheduled every six months. We like to ensure that plaque doesn’t build up and form into tartar. Your dental hygienists will gently remove all of the plaque and calculus in your child’s teeth to keep it clean and free from infection. Because children have rapidly changing teeth, dental X-rays help us see if there are any concerns about newly erupting teeth or tooth decay. A child’s dental X-ray is fascinating. We can see any possible issues with the current teeth as well as the future adult teeth developing below. Typically during the early years, we will recommend dental sealants. Sealants prevent the chewing surfaces of the teeth from getting cavities by protecting the grooves of the teeth from collecting food residue and trapping bacteria. The best part is, your dental insurance will likely cover all or most of the cost. Most family or pediatric dentists know how important it is to give you and your children proper dental hygiene instructions. These will serve as an in-home dental care guide to prevent future oral problems. Aside from my previous tips, it is essential that your dental hygienist or dentist gives you and your child the tools, tips and confidence to keep those pearly whites sparkling.